Inform communities about the harmful effects of nutrient pollution by providing research and resources for communities to share and utilize. Coastal systems face widespread environmental changes due to climate change (sea-level rise, increased water temperatures, etc.) and direct anthropogenic (human caused) activities. Pollution, especially nutrient pollution, can threaten an estuary’s productivity?, function, and stability. Excessive amounts of nutrients, specifically nitrogen and phosphorus, are introduced into our aquatic and coastal water systems by anthropogenic activities. Main sources of nutrient pollution are fertilizer and animal manure from agricultural runoff, discharges from water treatment plants, faulty sewage systems, stormwater runoff and industrial emissions.1 While all organisms require some nitrogen and phosphorus to function, excessive amounts of these nutrients are considered pollutants because they create stress within the system and overwhelm the environment, especially coastal systems. Increased runoff and erosion from more frequent and severe storms under future projections of climate change have the potential to intensify nutrient pollution and its effects. There is a diversity of microorganisms within marshes, and these different microorganisms provide different ecosystem services such as removal of nitrates and nitrites (denitrification), as well as decomposing organic matter. A long-term research project in Massachusetts showed that when an estuary becomes overwhelmed with high nutrient levels, the vast majority (up to 90%) of certain microorganisms will become dormant (stop functioning) as a protective response for the community.2 Additionally, decomposition occurs at an accelerated rate within nutrient-enriched marshes. This rapid decomposition, combined with other factors, promotes creek walls to crack, then collapse and further decompose. This response to nutrient pollution leads to destabilized creek walls and eventually wider creeks.3 This structural degradation from nutrient pollution reduces the estuary’s ability to protect coastal communities from storm events and increases rates of erosion. Stable creek walls that do not regularly experience nutrient pollution (left). A creek wall breaking, collapsing and decomposing into unvegetated mud in response to nutrient pollution (right). Both photos taken within the Plum Island Estuary in Massachusetts. Provided by the TIDE Project. The aboveground (stem) and belowground biomass (cluster of roots and rhizomes) of the common salt marsh plant, cordgrass (Spartina alterniflora). Provided by Amanda Davis. 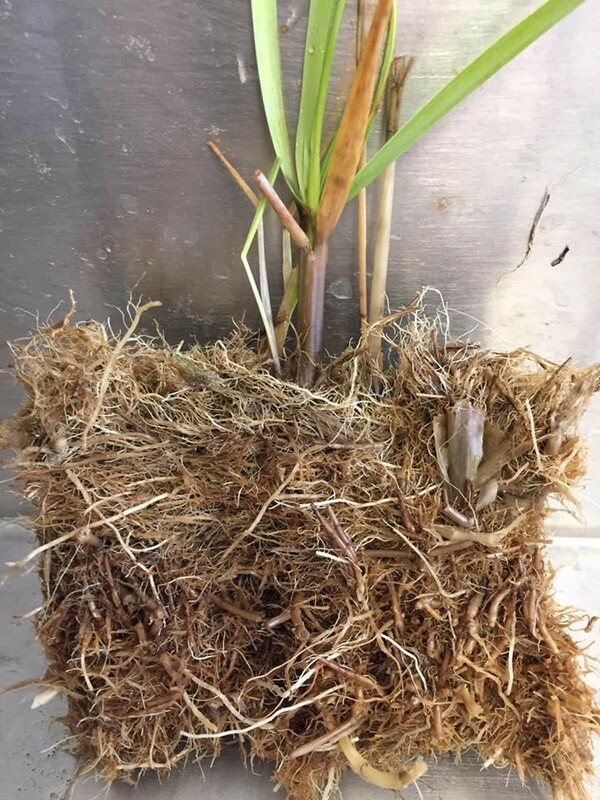 The belowground structure (biomass) of salt marsh plants (the root system) is responsible for nutrient uptake and storage. The roots and rhizomes of cordgrass (Spartina alterniflora) are key support structures for the salt marsh because they hold together the peat, clay and silt composition of the marsh. When estuaries are flooded with nutrient-polluted water, cordgrass receives ample access to nutrients and do not need to grow extensive root systems. Consequently, the belowground biomass of cordgrass is smaller, leading to weaker, less stable creek walls. This response ultimately contributes to the cracking, collapsing, and decomposing into unvegetated mud events that are documented in nutrient-polluted estuaries.3,4,5 The reduction in belowground biomass in response to nutrient pollution directly impacts primary production, coastal resilience, hydrology, and the creek wall habitat. Harmful algal blooms (HABs) are another effect of nutrient pollution. Algal blooms are occurring more frequently, for a longer duration, and over a wider geographic area than ever before.6 HABs occur when algae reproduces very quickly (exponentially) in a short amount of time. This algae blankets the water and blocks light from entering deeper waters. This lack of light stunts photosynthesis for algae that live in the water column and for aquatic plants that attach to bottom habitats. As aquatic plants and algae use available oxygen during the decomposition process, an oxygen deficiency commonly occurs. Without proper levels of oxygen (above 4-5 ppm), fish and shellfish can suffocate, resulting in expansive die-offs.7 Additionally, HABs can create toxic bacteria that prevent shellfish cultivation/harvesting, can prohibit swimming activities, and can cause respiratory problems.8 HABs generated from nutrient pollution and warmer ocean temperatures are costly to nearby human and ecological communities. The following actions can be used to address nutrient pollution and its effects. Assess regional sources of nutrient pollution. Identify estuaries that have been impacted by nutrient pollution. Initiate restoration efforts using the strategies listed below. While nutrient pollution and nutrient management continues to be a growing research field, there are proven strategies that the industrial sector and residential communities can implement now to reduce the amount of nitrogen and phosphorus that enters the water system in the future. Sustainable farming techniques can reduce the need for fertilizers. To improve soil quality, farmers can rotate crops, use grazing animals to provide natural fertilizer and cultivate a diversity of plants (polyculture) rather than growing only one type of plant (monoculture). Use Strategy and Green Spaces to Treat Runoff. 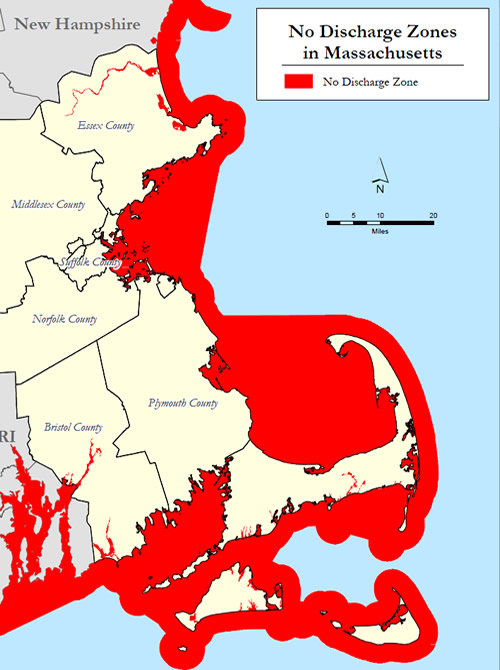 Massachusetts has designated its water (within 3 miles of shore) as a No Discharge Zone (NDZ) for all vessels. All vessels must either dump their nutrient-rich sewage past the state’s water or use a boat pump out station. 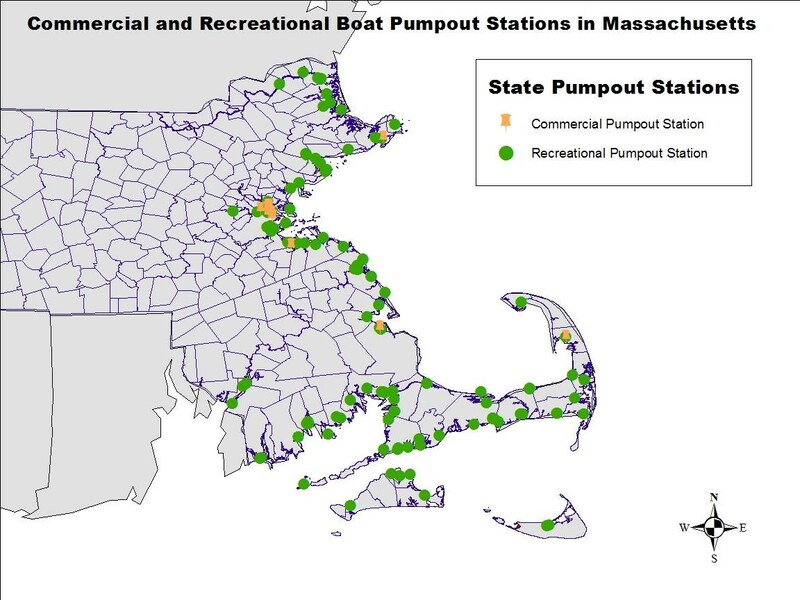 Pump out stations are better for the environment and states are funding more boat pump out stations.12 Boat pump out stations may be onshore locations and/or be performed by a boat that travels to vessels to provide the pump out service. 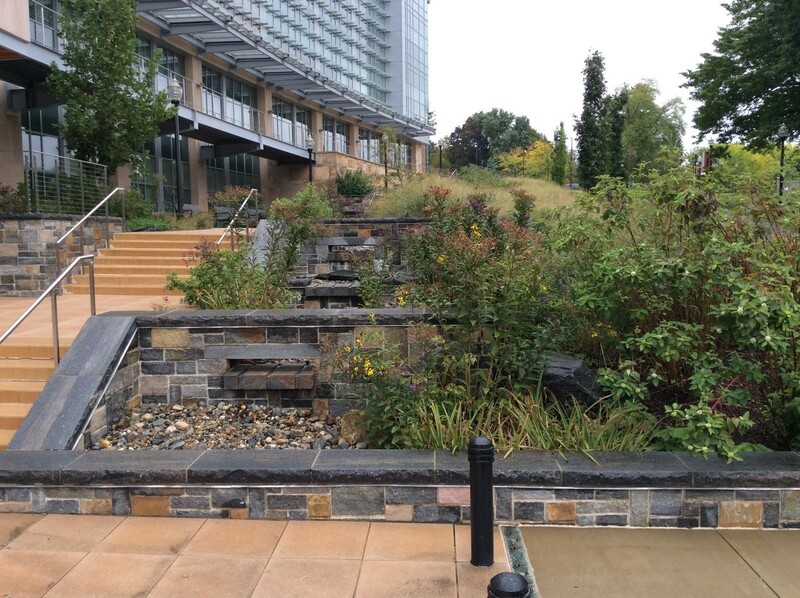 Two different rain gardens at University of Massachusetts. Rain garden is located at the entrance of the Fine Arts Center (left). Provided by Amanda Davis. Two different rain gardens at University of Massachusetts. 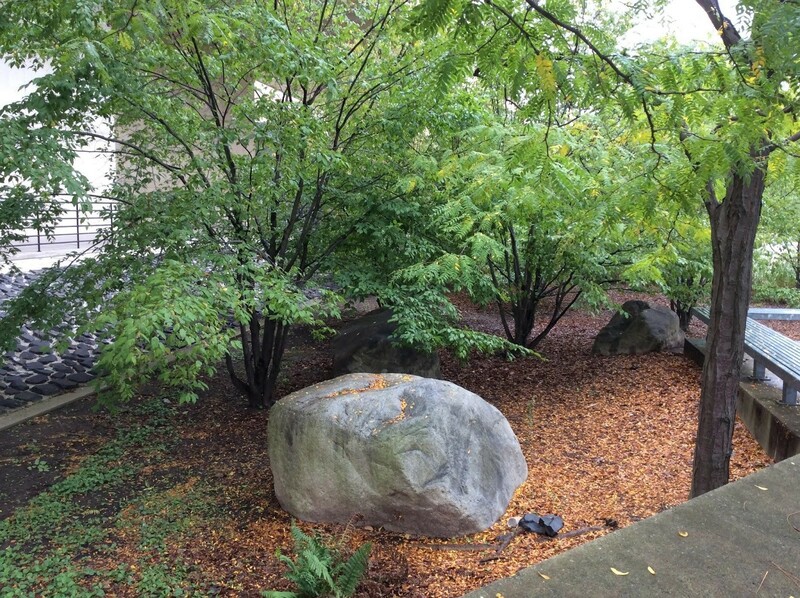 Rain garden is located the entrance of the Life Science Laboratories (right). Provided by Amanda Davis. Choose Permeable Hard Surfaces (Pervious Pavement) to Reduce Stormwater. Unlike traditional asphalt surfaces, engineered permeable hard surfaces such as pervious pavement, gives stormwater space to seep through, slow down, and infiltrate into the ground. Stormwater volume was shown to decrease by 13%, 36%, and 46% when traditional asphalt was replaced with permeable asphalt, permeable concrete, and permeable pavement, respectively.16 Initially, pervious surfaces are slightly more expensive than traditional pavement; however, since there is no need for additional stormwater treatment infrastructure (drains, pipes, retention ponds, etc. ), pervious surfaces are more affordable in the long-term and require less maintenance. 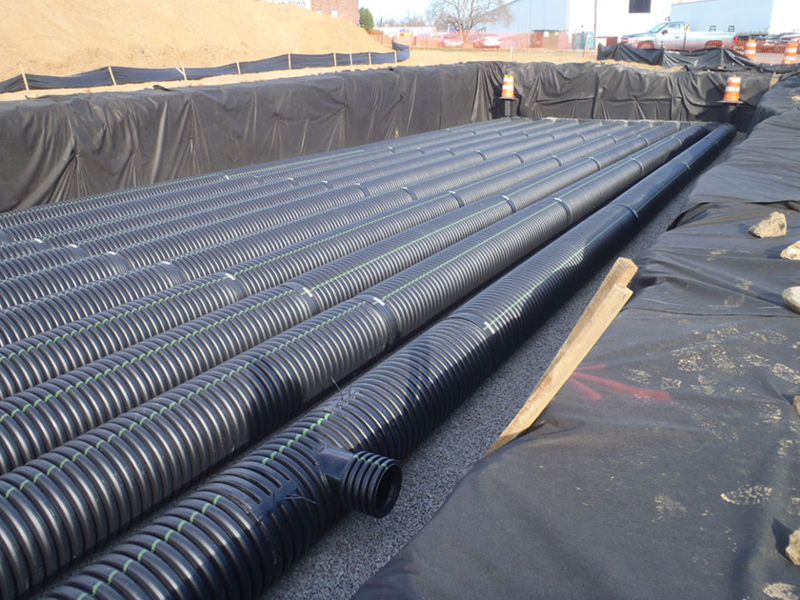 Subsurface Infiltration Systems (SIS) are man-made systems that treat stormwater like natural biological systems by capturing, storing, and filtering water. These systems are especially effective at removing nitrogen from wastewater using microbes and periods of aeration.17 SIS are expensive and can not be added to all storm drains; however, their ability to treat stormwater is effective. Natural compost is a better choice than chemical fertilizer to nourish plants. Soil can be further nourished and held in place by using mulch and/or raised garden beds. By containing garden sediment, there are less nutrients carried away during runoff events. If chemical fertilizer is desired, choose one that does not contain phosphates (the middle number in fertilizer represents phosphate content). Residential communities can reduce their nutrient loading into the environment by being mindful of their detergent usage. For example, car washing is best done infrequently on lawns instead of asphalt or at designated car wash businesses that have proper drains. Some states have taken action against strong detergents. Massachusetts is one of several states that has banned the selling of detergents that contain more than 0.5% phosphates.18 This includes detergents such as hand soap, laundry detergent, and everyday household cleaners. Create green spaces of tall and deep-rooted vegetation near waterways. The plants will filter and trap sediment-carrying nutrients while allowing nutrient-rich stormwater to infiltrate instead of flowing into waterways. Nutrient pollution is driven by anthropogenic (human-caused) activities and weakens the estuarine environments that protect coastal communities. More frequent and extreme storms are projected under future climate change, which is expected to intensify nutrient pollution by increasing runoff and erosion. While there are technologies than can mitigate nutrient pollution, it has been proven that green spaces are one of the most effective management practices to combat nutrient pollution as well as sediment pollution. If communities do not implement nutrient pollution management and mitigation efforts as climate change increases, their infrastructure, environment, and economy may become more vulnerable to additional stressors. 2. Kearns PJ, Angell JH, Howard EM, Deegan LA, Stanley RH, Bowen JL (2016) Nutrient enrichment induces dormancy and decreases diversity of active bacteria in salt marsh sediments. Nature Communications. Accepted 10 August 2016. 4. Deegan LA, Bowen JL, Drake D, Fleeger JW and others (2007) Susceptibility of salt marshes to nutrient enrichment and predator removal. Ecol Appl 17: S42−S63. 5. Deegan LA (2002) Lessons learned:the effects of nutrient enrichment on the support of nekton by seagrass and saltmarsh ecosystems. Estuaries 25: 727−742. 6. Gilbert, P.M., Anderson, D.A., Gentien, P., Graneli, E., Sellner, K.G., (2005) The global, complex phenomena of harmful algal blooms. Oceanography 18 (2), 136-147. 8. Heisler, J., Gilbert P.M, et al. (2008) "Eutrophication and harmful algal blooms: a scientific consensus." Harmful algae 8.1 : 3-13. 10. Joannon, A., Souchère, V., Martin, P. and Papy, F. (2006) Reducing runoff by managing crop location at the catchment level, considering agronomic constraints at farm level. Land Degrad. Dev., 17: 467–478. doi:10.1002/ldr.714. 13. Horton, R., G. Yohe, W. Easterling, R. Kates, M. Ruth, E. Sussman, A. Whelchel, D. Wolfe, and F. Lipschultz, (2014) USGCR: Ch. 16: Northeast. Climate Change Impacts in the United States: The Third National Climate Assessment. 16. Alyaseri, I. and Zhou, J. (2015) Comparative Evaluation of Different Types of Permeable Pavement for Stormwater Reduction—St. Louis Green Alley Pilot Study. International Low Impact Development Conference 2015: pp. 274-284. doi: 10.1061/9780784479025.028. 17. Pan J, Fei H, Song S, Yuan F, Yu L. (2015) Effects of intermittent aeration on pollutants removal in subsurface wastewater infiltration system. Bioresour Technol. 2015 Sep;191:327-31. doi: 10.1016/j.biortech.2015.05.023. Epub 2015 May 16.